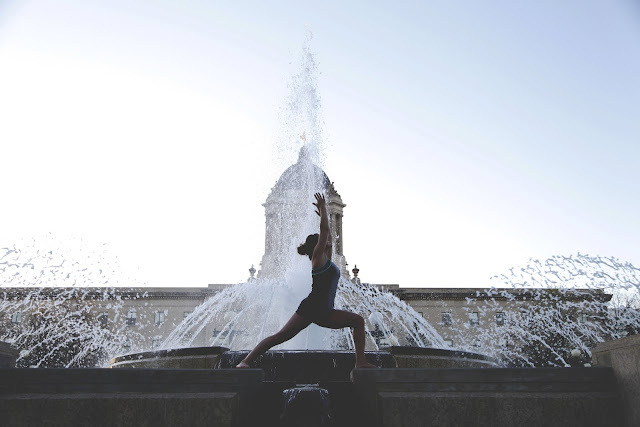 Prairie Yogi and former Oxygen model Tannis Miller gives us insight into the world of competitive fitness modelling and how yoga has shifted her perspective on life, self-love and finding balance. 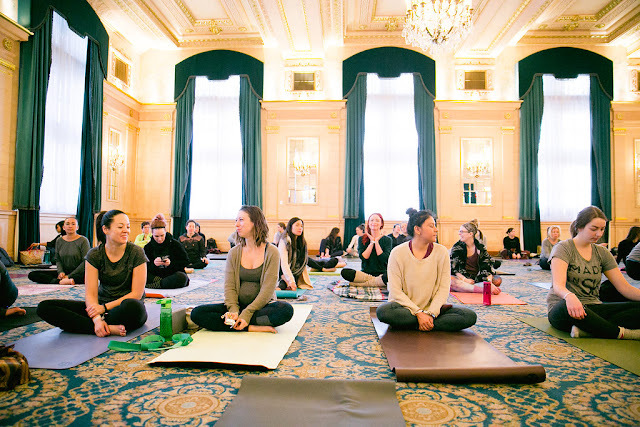 I had always appreciated the heavy sweat and toxin release that came from hot yoga, but it wasn’t until January when I took part in the day detox challenge at Yoga Public in Winnipeg that I really started to recognize the value of yoga for me. The results developed on a deeper level than I thought possible, and they certainly didn’t end with the way my body looked on the outside. In thirty days, I took nearly fifty yoga classes, and in that short amount of time became aware of how I could apply my drive with fitness into something with more relevance and an evolved purpose for me. Tannis Miller, at the height of her fitness modelling career, won multiple titles and secured a much-coveted photo shoot with Oxygen Magazine. I used to live in a mindset where effective exercise, when paired with commitment was to be aggressive, taxing on the mind and body, and completed simply in order to move closer and closer to a physical goal. Until lately I would've admitted that these are typical components of an athletic lifestyle, and part of the honest price one would pay to feel comfortable and even proud in their own skin. If I hadn’t found yoga and truly accepted it into my life, I also wouldn’t have had the opportunity to appreciate my body and mind as an intertwined system of togetherness. I wouldn’t have truly realized how I could carry my developing strength from the mat into the real world, and I wouldn’t have had the ability to thoroughly experience the cohesion of flexible muscles with a flexible mind. My personal journey with yoga over the course of the last few months has slowly fostered my confidence to let go of a big part of my life as I once knew it, and to break out of the box I thought I had to be in, in order to be fit. At first, yoga was simply another form of exercise for me, something sporadic I would do to balance out the busyness of the gym atmosphere, which had become my second home. 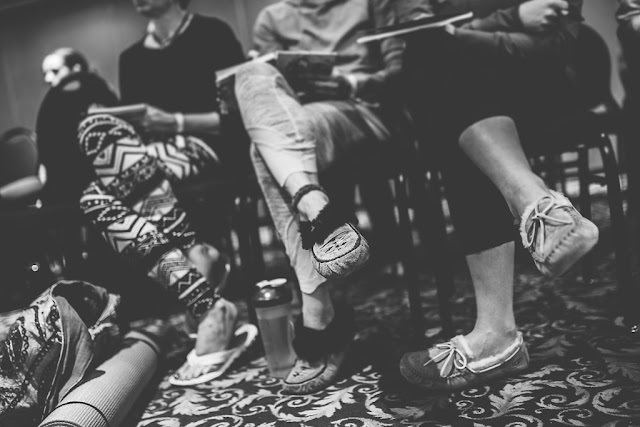 As a personal trainer immersed in fitness competitions, I grew to have very inflexible ideas. Yoga was a task, as opposed to something that was a part of me. Deep down, I always knew bodybuilding training wasn’t for me, but its inability to transfer to real world use, was the catalyst that sparked a change in my beliefs. As I continued to broaden my horizons and deepen my knowledge, training splits like “back and biceps”, “chest and triceps” were just things I couldn’t identify with anymore. I quote the word “bodybuilding” because most people will immediately think of big beastly people oiled up and standing on stage. Instead, I am referring to the style of training itself which encompasses a broad spectrum of today’s mainstream fitness. As I exposed in my last article “My Last Six Months” (posted below!) my seemingly narrow minded focus with how I took care of my body had begun to carry away my perception of what really mattered to me, and it started to backfire in more than one way. Simply put, training to compete in these contests taught me to believe in such severe right and wrongs and diminishing balance altogether, but oddly enough it was easier than mastering moderation and balance in real life. Now, that took time. How was this possible? This was new territory for me that I knew I had to conquer if I wanted to escape this ridged reformatory I called life. I was on my own and I was set out to look and feel my best without deadlines and competitions to lure me into that familiar unstoppable motivational state. I was going to do this…I needed to. Remarkably enough, when I decided to shift my priorities and instead look inward for direction in this new chapter, I found myself headed down a physically healthier path and my increased mental strength was a mere by-product. With a big ode to yoga, it all seemed to take care of itself. Seeing fitness through a different lens started to become as exciting of a venture as it was when I fell in love with it in the first place. Yoga serves as a primary component in my fitness routine alongside running, circuit training, TRX classes, and I always feel as though my personal challenges are met each time I peel my sweaty self off the mat. Calm and with a clear mind, knowing I held my composure in more ways than one is always an amazing start or finish to my day, and also a solid step in the right direction for my personal fitness ambitions. The long static poses, inversions, and balances are things that need to be nurtured with regular practice to become fluent, but with yoga there is no rush to master it in order for it to be effective. Yoga, is like life itself, never perfect, but always evolving. Much like weights in a weight room, your body will be forced to continue to adapt as you become stronger and more in control of your body’s movements as you take hold of new and more difficult poses. I’ve said it before, but this forgiving and even spiritual endeavour is far beyond a workout for me. It has taught me to look inward for focus, and to develop my strength from the inside out. It's not a job I have to go to, it's not something I feel obligated to fit in my day. Instead, it brings me peace, different perspectives of strength, and control- or rather the strength to let go of control. Sometimes the most obvious things are the most difficult to see, but yoga has shown me that I'm responsible for my own destiny. I know that there are no wrong turns, only paths we had not known we were meant to walk. The last few years of my life have been centered around fitness modeling competitions, and my attempts to climb as far up in this industry as I could. For me to distance myself from this community, or my world as I knew it for a large portion of my adult life has naturally instigated many questions from clients, friends, and followers regarding this shift for me. Raw and truthful, here it is. Relieved is about the only word that I can think of that completely sums up the feeling I have for what I’ve come to realize over the past few months. The mental place I find myself living in today is almost looking at the world from a different angle, with a different pair of eyes. In terms of my lifestyle and fitness, I always thought I had it together, had balance, and most certainly knew what my goals were and what I needed to do to get there. I was a fitness model, a trainer myself, and this is what I did…who I was. Motivation had never been a problem for me, nor was sticking to a game plan. If I said I was going to do something I was passionate about, you could count on it that I would get it done and do it to the best of my ability and this new fitness modeling endeavor was no different. It was something I thought would compliment my love for healthy eating and my active lifestyle, but did I start to lose sight of why I fell in love with these things in the first place? I had to ask myself, was I following my passion or was I getting off course with my goals and values? Before my first fitness contest in 2008, I started to appreciate how eating cleaner foods made me feel, and how my body started to transform in conjunction with proper workouts. I had always been interested in health and fitness, but like many young women, I lacked the knowledge and structure of a proper workout routine or diet to yield the results I desired, so when I slowly started learning more and tweaking my lifestyle in this regard and seeing my body and fitness level change, it was so easy to stay motivated. I had the support and guidance of my athletic boyfriend who had like minded sets of goals, and we even ran the Manitoba Half Marathon together. I felt so accomplished and I loved that I was in control of something that was not only important to me, but so genuinely good for me at the same time. It was then that I decided to try out “one of those bikini contests” that had been advertised sporadically around tanning salons and on Facebook. I thought, “Hey I can do that, why not?” I could check the half marathon off my bucket list and this would be no different. And with a snap of a finger I did just that, and my world changed. I won that contest and I never looked back, I was in deep! Family and most friends were supportive of my new whirlwind life of photoshoots and contests, but it was hard to expect them to fully swallow why I couldn’t have a glass of wine, why I was carrying around all of my food in plastic containers all of the time even though there was a plethora of healthy food around, and why I had to leave functions prematurely to fit in yet another cardio session. I stuck up for my choices so many times that I had the perfect responses ingrained in my head for every question or comment. It was tedious but necessary since it seemed to be such a bizarre life for most people as it was repeatedly brought up in conversation. This hobby, sport, or whatever you wanted to call it was consuming me as greatly as any passion would, but since it was based on the outward appearance and aesthetics, it was a bit different than training for any other sort of athletic endeavor. I was basically volunteering to be judged as a hobby. In this game, the more exposure the better. At times, I would feel my efforts weren’t being matched with the outcomes if a magazine didn’t think I fit the right 'look' which would depend on the sets of eyes looking, or if I didn’t place in the top of my class at a contest. But again, I learned, that was the name of the game I chose to be a part of. This industry never claimed to be fair. Competing in something with such un-measureable outcomes also naively didn’t phase me at first, but genuinely not letting a judging panel with such subjective opinions influence my happiness got harder and harder to do. My immense effort and personal outcome always did me proud regardless of the placing I walked away with at these shows, but I became to seriously ponder if my extreme dieting and long cardio sessions involved in these many show preparations were going to wreck havoc on my health long term. Was it worth my health and well being, sanity, and personal relationships to climb up in this industry as high as I thought I Initially wanted, for the sake of gaining recognition and acceptance in an industry that seemed to so inconsistently choose their ideal “look”? If I was happy with my body on a personal level, were my true end goals actually met? My mission here is to educate you on what you’re getting involved with ahead of time since it can be tough to see clearly while you’re in the eye of it. Know what type of competitive scene it is you’re getting yourself into before you go through with it. Most of all, make sure you’re doing it for your unique and right reasons personal to you, and you’re showing up that day in your best shape without much merit placed on scores or even opportunities that could potentially arise. Personally, looking back on my time as a fitness competitor and I’ll be the first to admit, obsessive was an understatement and it started to take more and more of an unhealthy mental twist and more and more out of my mind as well as well as my body. This just wasn’t normal. No matter what type, dieting wasn’t working well mentally for me anymore and by opening my eyes to what was going on around me, it was seemed inevitable that I would be setting not only my body up, but my mind up for a rebound afterward. The joys and the highs that came from seeing my physique look very similar to all my fitness idols from magazines and commercials lost it’s power to motivate me as well, and instead I started to truly envy people who looked healthy and fit all the time without turning their life upside down to do it. The most unhealthy part of all of this isn’t necessarily the extreme trend-like training some trainers preach upon their clients. I don’t believe there is enough information out there for new or prospective fitness competitors entering this world for the first time, and I certainly feel that there can be detrimental and long term negative effects of what repeatedly bland or variety-lacking meals and diets can do to a person. Bodybuilding or being in the mind set of a bodybuilder can be a 24 hour job. As a bodybuilder you are constantly trying to define yourself. Continually trying to improve on previous definitions of yourself or re-defining areas of a particular interest. Having complete definition is their goal. They live for it. They strive to have it. As per Bodybuilding.com, this is the definition of Bodybuilding - when the average person just wants to feel fit, leaner, faster, healthier, or live longer. Does it not seem skewed to live in the same mental head space as someone would with entirely different goals? These were questions that would often arise in my mind that I had tougher and tougher times answering. At just what cost will someone go to to look a certain way? Fitness modeling, fashion modeling, or any type of endeavor that encourages a person to change their outward appearance to succeed is going to eventually take it’s toll on the mental health of someone. In a world where it matters less about how you feel than how you look, it seems almost more common to see a trainer or company advertising and promoting fad styles of training and diets claiming to be “healthy” that parallel bodybuilder’s regimes rather than an actual healthy and balanced plan focused on longevity, vitality, and true fitness. Getting in shape is or should be about feeling good, not being a slave to get there. Part of being healthy is going out for wine and appetizers with my girlfriends, or for a walk with an ice cream cone in the summer with my boyfriend. Most importantly and stemming from my new mindset, I have learned that being truly stable and healthy is not having an off season or on season. I believe that partaking in regular exercise in the form of training in the gym, sprinting, yoga, dance classes, or whatever you enjoy doing need to be what you truly love to do, and the best longest term results will come from that journey. I believe that the happiest life for me involves enjoying clean foods and a variety of foods without restrictions and categorizations of “good” or “bad”. Living a life where carbohydrates are not the enemy, perfection is never strived for, cheat meals do not exist, and gym time is not something I’m not a slave to is my perfect and healthiest life I can imagine and stepping away from the competitive world of bikini and fitness modeling was the best solution for me to reach this seemingly impossible feat. Simply enough and through all of my experience in this amazing eye opening journey is that I’m an active girl, not a bodybuilder and I shouldn’t have to nor will I allow myself to live like one to look and feel great.